The former Top Gear 2.0 presenter is earning over £2 million – more than four times the amount of the BBC’s highest-paid woman. 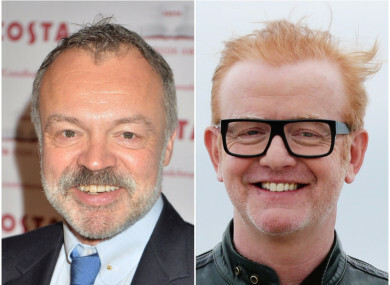 Celebrity talk show host Graham Norton and former Top Gear presenter Chris Evans are among the BBC's top-paid stars. CHRIS EVANS, GRAHAM Norton, and Gary Lineker are the BBC’s top three paid presenters, according to figures released in the broadcaster’s annual report. The exact pay package for each staff member or contributor isn’t revealed; instead different pay-ranges are divided and people are listed in groups. For example, ’on-air talent and contributors’ to the BBC include Guy Henry and Tim Roth (on £150,000 – £199,999 a year); Peter Capaldi and Emilia Fox (£200,000 – £249,999); and Gary Barlow and Dannii Minogue who are under non-scripted television pay-outs of between £200,000 – £249,999. Presenters Andrew Marr and Stephen Nolan are on between £400,000 – £449,999 a year, while Eddie Mair, who hosts BBC Radio 4′s PM and NewsPod, is on £300,000 – £349,999. “We have significantly reduced the total bill spent on paying talent, down again this year by 2.5%. The bill for top talent is down 10% year on year, and down by a quarter over the last five years. At the same time, there has been significant cost inflation across the industry, so that BBC has made savings in an environment where costs are significantly up. As the presenters’ earnings were announced this morning, some criticisms were leveled at the BBC for a gender pay gap between their staff members and contributors. The BBC’s highest paid woman is Claudia Winkleman who’s on between £450,000 and £499,000. Hall admitted that only one-third of its top-paid staff members are women, saying that “we’ve made progress, but we recognise there is more to do”. “We’ve set a clear target for 2020: we want all our lead and presenting roles to be equally divided between men and women. And it’s already having an impact. If you look at those on the list who we have hired or promoted in the last three years, 60% are women and nearly a fifth come from a BAME (Black, Asian and minority ethnic) background. The Guardian has put this list together of presenters, and compared their experience to see if the gap is one based purely on gender. Email “Chris Evans and Graham Norton among BBC's top-paid presenters”. Feedback on “Chris Evans and Graham Norton among BBC's top-paid presenters”.